The operation of almost every large organization, including the Department of Defense (DoD), has become dependent on commercial off-the-shelf (COTS) software, including applications and operating systems. The prevalence of COTS software failures due to security breaches, misconfiguration, and bugs has a severe impact on computing systems performance. A few software packages, such as Microsoft® Windows and Office, are heavily deployed and used daily by personnel throughout the DoD. Many users experience the same failures, which are caused by the same vulnerabilities, configuration errors, and bugs, and suffer the same costly, undesirable consequences. Such homogeneity accentuates the risk, since a single serious vulnerability could be exploited by a determined adversary, to catastrophic effect. The goal of the VERNIER project is to turn the size and homogeneity of the user community into an advantage by converting scattered deployments of vulnerable COTS systems into cohesive, survivable application communities (AC) that detect, diagnose, and recover from their own failures. The VERNIER project combines robust, survivable host-based execution environments with collaborative diagnosis and response functions communicating over a hierarchical, scalable knowledge-sharing infrastructure. The system is composed of clusters of nodes, each running the VERNIER augmented version of VMware®, along with our custom software. A COTS application running safely under supervision of an extended virtual machine monitor (VMM) may enter an undesirable state, as a result of malicious network input, or buggy COTS code. An alarm raised by the VERNIER system then rolls back execution to a desirable state, using virtualization capabilities. Simultaneously, the diagnosis engine combines execution trace information with community information to formulate a response. This may involve blocking malicious network traffic, modifying the system configuration, repairing program state, or other compensating actions and preventive measures. 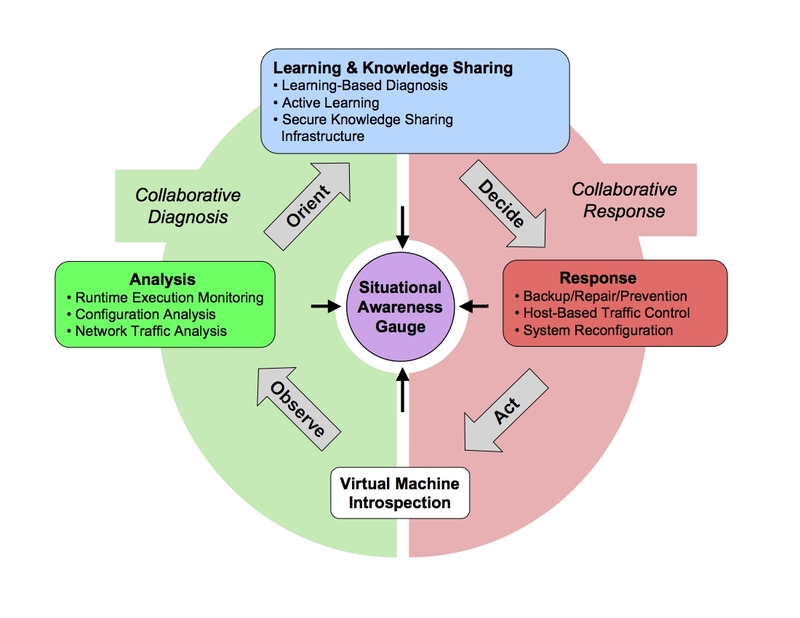 Situation awareness is maintained for the entire community through dissemination of event diagnosis and response options across the communication infrastructure, allowing other VERNIER hosts to prevent similar events. The operation of VERNIER is best conceptualized using a cognitive "Observe, Orient, Decide, Act" cycle (see figure). At the lowest level, VERNIER uses Virtual Machine Introspection (VMI) technology on individual nodes to observe the state and operation of COTS applications and network activity. These observations form the raw input for Collaborative Diagnosis, which consists of Runtime Execution Monitoring, Configuration Analysis & Monitoring, and Network Traffic Analysis. VERNIER orients this data by Learning & Knowledge Sharing, which consists of Active Learning, Abstraction-Based Diagnosis, and a Secure Knowledge Sharing Infrastructure. Once the status of the Application Community members has been successfully diagnosed, the community will decide how to respond in its current state. Collaborative Response technologies include Backup and Repair/Prevention, Host-Based Traffic Control, and System Reconfiguration. VERNIER will act upon these decisions by using VMI to manipulate the current state of Application Community members. In addition to the aforementioned diagnosis and repair capabilities, VERNIER features a Situational Awareness Gauge (SAG) that makes use of all parts of the system to provide not only a concise view of the community's current status but also early indications of potential threats to security and reliability. This project is sponsored by the Defense Advanced Research Projects Agency (DARPA) under the Application Communities (AC) program. We also gratefully acknowledge the support of our technology transition partner, VMware, Inc.